I am looking at a photograph of the sculptor, Anna Mahler. She is a small woman, standing on a scaffold in front of a huge block of stone three times her height, a hammer in hand. She is chipping away, attempting to bring form out of that intractable mass. Each day she crawls up that scaffold, putting the hammer against stone, the effort reverberating through her hand into her body, she is sweating and aching with effort, driven by what unknown desire. . . . ? Like Anna Mahler, we determined memoirists come face to face with the obdurate stone of our material. The little hammer of desire is all we have with which to fashion something of beauty. The scaffold of aspiration offers access to height – we can start at the top or the bottom. I frequently think of Anna Mahler’s persistent commitment as I confront the work of memoir. How to bring forth those characters hidden within the inscrutable stone of memory? How to press an ear to the lips of those inside; to hear their whispered voices? How to cooperate with material that can often feel resistant and unyielding, whether it be 28 tons of Indiana limestone or hundreds of pages of words? 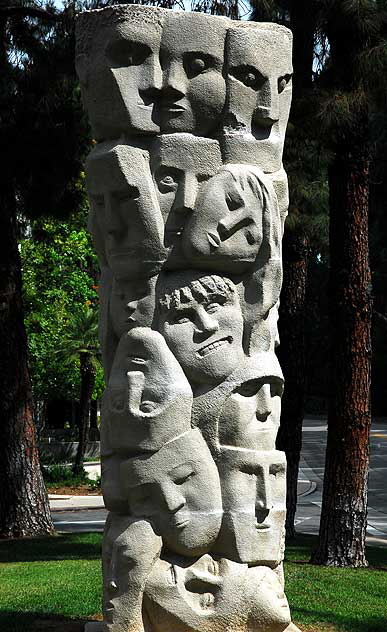 Mahler’s daunting effort resulted in the Tower of Masks, a sculpture I passed every day on my way to art classes at UCLA in the early 80’s, never considering the artist or what she undertook. At Mahler’s memorial, her daughter described how each morning her mother went to her outdoor studio and “at a small wooden table, in total silence, she played solitaire to let the next move grow within her. To listen to it . 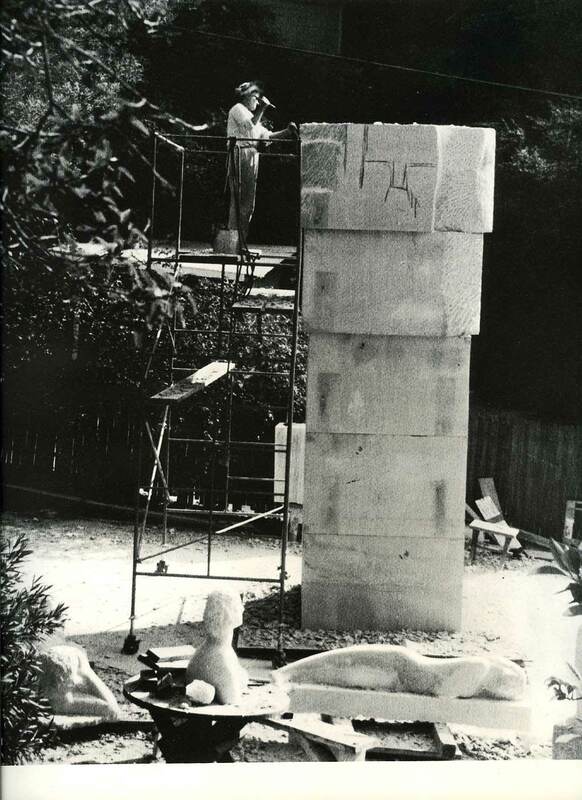 . . .” She reported that with her monumental sculptures Anna Mahler liked best to attack the stone directly, often without a preliminary sketch. She respected the will of the stone, something that could be mastered, but never denied. When I look to Mahler’s Tower of Masks for inspiration, I do not see a Tower of Babel with its confusion of tongues, nor the conventional upturned or downturned mouths of comedy and tragedy. As a memoirist, I perceive the masks as dramatis personae, a forceful cast of characters that make up a work of life depiction. In the grimacing countenance at the center, I recognize the teeth-gritting effort of the artist; the tilted face above hers is struck sideways by grief and compassion, while the tight masculine mouths reveal stern authority, judgment, even censorship, as well as sheer determination. The solitary, cowled monastic stares into the void with her visions; the upside down head on the left assumes, like the Hanged Man in the Tarot, a self-sacrificing position in hopes of an unexpected point of view; and the horizontal face with closed eyes at the base lays down to rest, perhaps incubating a dream, while tucked next to it, as in all our beginnings, an innocent open-faced child looks up. One Response to Carved in Stone? Beautiful Patricia, I love this line, How to press an ear to the lips of those inside; to hear their whispered voices? Perhaps what emerges from our memory is essential to know for each writer and for the times. Your words speak well to the Masks that have emerged from the stone and even though no human face “looks like that,” still they speak a truth to us, maybe that’s true of our flawed memories as well. Thank you for this reflection.